Sometimes, we need to step back and really re-think the price of restaurant food as we know it. Sure, most smaller Asian joints are good value, hence no real issue there. But for your typical chain restaurant, it has slowly crept up to some lofty numbers. Most items cannot be had for less than $12.00 and many are between $15.00 - $20.00. I know, there is overhead such as food costs, staffing, rent, advertising and so on. But what if you just wanted to get some decent food for under $10.00 (how about under $6.00)? Oh and the place is not a dive nor located in a sketchy area? 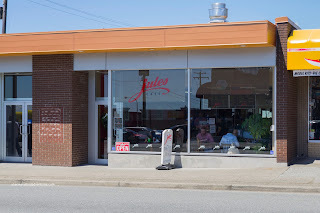 Well, we were about to find out as we visited Jules Cafe after Sunday hockey. Since Jules is an "order-at-the-counter-first" operation, it was imperative we found a table. So as we were waiting for the first available seat, I looked over the menu. The low prices encouraged me to order not one, but 2 meals. I started with the Eggs Benny since it was the most interesting breakfast item. 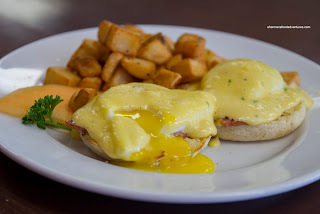 The hollandaise sauce was almost like a foam where it was super light and frothy. Flavourwise, it was not very rich as you can imagine. I did pick out some lemon and a touch of butteriness, yet it could've benefited from more zip. As for the egg, it was poached nicely with a very runny yolk. The English muffin could've been toasted a bit more in my opinion as it became quite mushy with sauce and yolk. The fried hashbrowns were golden brown and crispy with a soft potatoey interior. 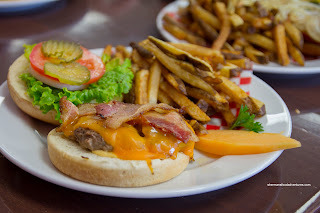 For my next course, I had Jule's Bacon Cheeseburger which looked, at first glance, like any other diner burger. Oh how wrong I was. One bite in and it was super moist and light. 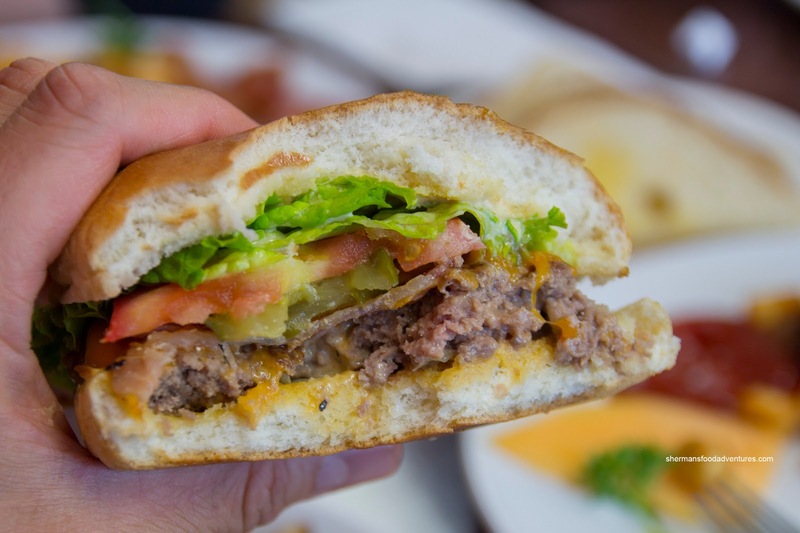 The homemade patty was not greasy and just barely cooked. The house-cut fries were golden in colour but ultimately were soggy. And if you were wondering, I did finish both dishes. JuJu, not to be outdone, had 2 dishes as well starting with the French Toast. It looked appealing and was ultimately quite good. There was enough egg to coat both sides of the bread without making it soggy. It was moist though with a dusting of cinnamon and icing sugar. I personally would've preferred that it was browned a bit more on the outside for some textural contrast and flavour. 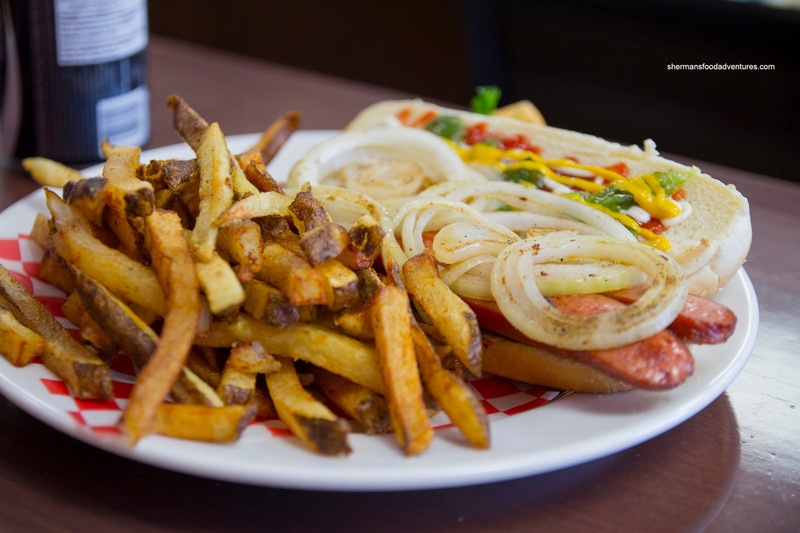 For his second act, he had the Grilled Hot Dog with a side of fries. As you can see, they weren't messing around with this hot go as it was split and fully dressed with a considerable amount of grilled onions on top. This was pretty standard except the onions could've used more time on the pan. The large mound of house-cut fries were the same being not crispy enough. Milhouse totally wimped out and ordered only a Super Traditional Breakfast consisting of 3 eggs, 3 slices of bacon, 3 sausages, hashbrowns and toast. 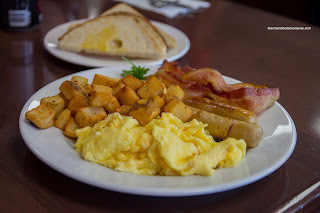 It was carefully prepared where the scrambled eggs turned out soft and fluffy. After it was all said and done, we were amazed at the prices combined with decent food quality. The people were super friendly while the place was well-kept. 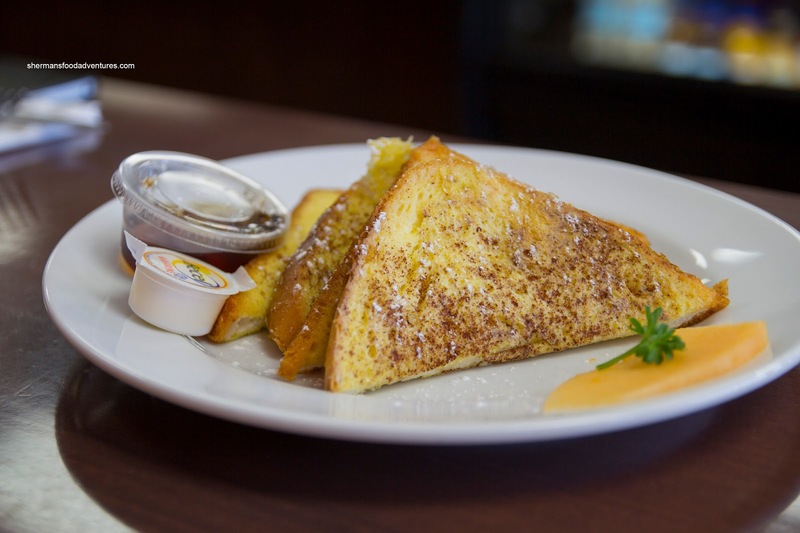 We realize that the operational costs of this cafe is far less than some other restaurants, but you really can get decent grub for cheap - if you look for it. What were the prices ? @Tony - wow that's prices from the '80s, unbelievable. Must try soon. Thanks ! Sherman: have you tried Jimmy's Place in that strip mall across from White Spot on North Road @ Lougheed? Same counter-style diner, a bit more expensive, better food, particularly the burgers. 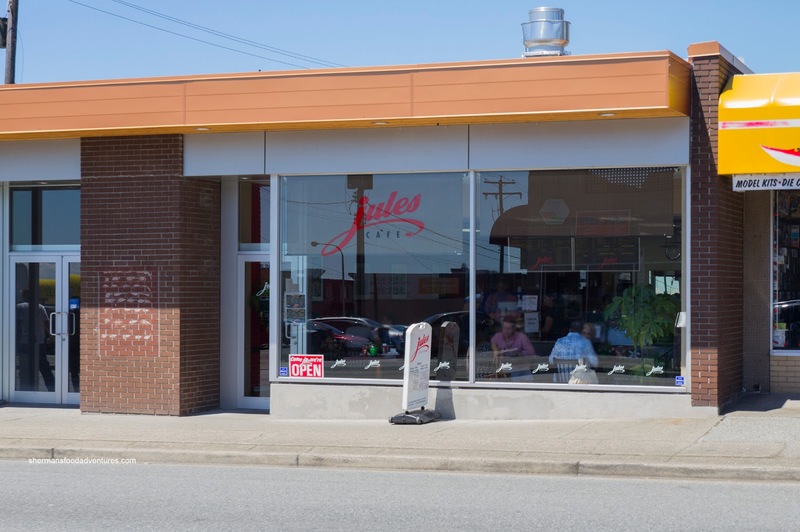 Sherman: How did the burger at Jule's compare to those at Burger Burger? @LR @Tony Thanks for posting the menu Tony! @Steve I like the burger at Burger Burger more. I had a very disappointing burger at Burger Burger last month :-( And I think I got ripped off (price) by them too. A single 6 oz patty, *no* cheese but all fixins, with fries and can of soda, advertized for $6 came to just under $9. Dragon lady said that price is only for 4-oz patty, while 6-oz patty adds $2. WTH ?!? BTW, at Burger Burger, owner lady said the prices on the price board aren't updated.